Accessories: Accompanied by presentation box. Furthermore, this watch is offered with an Extract from the Archives confirming its production date on September 7, 1960 and delivery to Italy. Literature: For a similar example see Omega Watches, John Goldberger, pg. 222.
in 1957 and remained in production until 1959, when its successor – the present lot with reference 2998, was introduced. 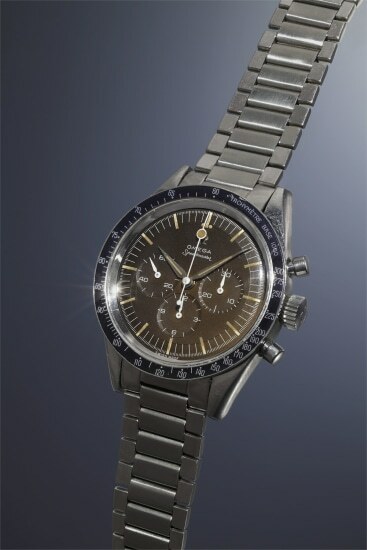 The Speedmaster was targeted for ‘active clientele’, solidifying its position as the official Olympic timekeeper. The superb example offered here dates to 1960, and features the legendary Omega caliber 321. Fitted with its original black tachometer bezel graduated to 1000 units, the scale was designed for scientists and sportsmen to be able to quickly calculate speed in conjunction with the chronograph complication. The original chronograph hands and the luminous hour markers on the dial are amazingly well-preserved for a watch from this time period. Its original Omega steel reference 7912 bracelet, with expandable links, completes it. This watch has aged beautifully over time, developing a charming and unique chocolate-tone color. This reference 2998-1 is offered in a superb condition and it is accompanied by its original presentation box, representing a great value for the savvy collector. A very rare and highly attractive stainless steel chronograph wristwatch with ‘tropical’ dial, tachometer bezel, bracelet and original presentation box. A very rare, highly attractive, and large stainless steel chronograph wristwatch with charismatic silver-colored dial, step bezel, and red-colored central elapsed minute counter. An extremely rare and highly attractive early stainless steel Oyster Cosmograph wristwatch with silvered dial and bracelet. A very rare and highly attractive stainless steel chronograph wristwatch with rose colored dial, telemeter and tachometer scales. A very rare and attractive stainless steel chronograph wristwatch with black ‘tropical’ dial, unusual lugs, tachometer and telemeter scales. A very rare, oversized and important stainless steel chronograph wristwatch with matte black dial, rotating bezel, luminous Arabic hour markers, made for A. Cairelli Roma. An extremely rare and highly attractive stainless steel chronograph wristwatch with silvered dial and bracelet, retailed by Tiffany & Co.
An extremely rare and attractive stainless steel chronograph wristwatch with black dial, telemeter and tachometer scales, retailed by “Rud. Niklaus Berne”. An extremely rare and highly attractive stainless steel chronograph wristwatch with silvered dial, tachometer bezel and bracelet, retailed by Tiffany & Co.
An extremely rare and highly attractive stainless steel chronograph wristwatch with two-tone silvered dial, applied Arabic and baton hour markers, outer tachometer scale and bracelet, retailed by Freccero. A very rare and attractive stainless steel chronograph with black dial, rotating bezel, rubber chronograph pushers, red chronograph hand and bracelet. A very rare and highly attractive stainless steel chronograph wristwatch with outer blue tachometer scale and memory subsidiary dial. An extremely rare, highly attractive stainless steel fly-back chronograph with black dial, luminous hour markers , and rotatable bezel. An extremely rare and highly attractive stainless steel chronograph with black lacquer dial, red 24-hour hand and additional crown to stop the seconds. A very attractive and extremely rare stainless steel chronograph wristwatch with black dial and rotating bezel. An extremely rare, attractive and large stainless steel split-seconds pilot’s chronograph with black lacquer dial and outer tachometer scale. An extremely rare and highly attractive stainless steel pilot’s single button chronograph displaying a black dial featuring Arabic numerals, revolving bezel and bracelet, made for Romanian Military pilot Sireteanu Alexandri. An extremely rare and oversized stainless steel fly-back chronograph wristwatch with black dial, tachometer scale and rotatable bezel. An extremely attractive and rare stainless steel chronograph wristwatch with black dial and rotating bezel calibrated for twelve hours. A very rare and highly attractive stainless steel chronograph wristwatch with porcelain dial, bracelet and original guarantee. An extremely rare, highly attractive and important stainless steel chronograph wristwatch with multi-tone silvered sector dial, black enamel Arabic and baton hour markers, and tachometer scale. An extremely rare and highly attractive stainless steel chronograph wristwatch with ‘tropical’ Paul Newman dial, tachometer bezel, outer red 1/5 seconds division track and bracelet. An extremely rare, highly attractive and large stainless steel fly-back chronograph wristwatch with ‘tropical dial’, oversized register at three o’clock position and rotating bezel. A very rare, highly attractive and early stainless steel pilot’s chronograph wristwatch with black dial, “beads of rice” slide rule bezel, and expandable bracelet. An extremely rare and highly attractive stainless steel chronograph with off-white dial, ‘tropical’ outer minute track, tachometer bezel and bracelet. An extremely rare and highly attractive stainless steel chronograph wristwatch with silvered dial and tachometer scale, accompanied by Certificate of Origin and presentation box. An extremely rare, attractive and very important stainless steel single-button continuous fly-back chronograph wristwatch with black lacquer “California” dial, rotating bezel and bracelet. A unique stainless steel fly-back chronograph wristwatch with skeleton dial and beige luminescent indexes, made especially for the START-STOP-RESET auction to benefit Fond’Action. A very rare, highly attractive and large stainless steel chronograph wristwatch with black dial featuring ‘Viceroy’ colors and rotating bezel. A very rare, attractive and oversized stainless steel chronograph wristwatch with enamel dial and multi-colored tachometer scales. An extremely rare, attractive and important stainless steel chronograph wristwatch with black ‘racing’ dial, tachometer bezel, and screw-down caseback. A very rare and highly attractive stainless steel chronograph wristwatch with black dial, tachometer scale, and enlarged 45-minute register. A very rare and unusual square shaped PVD-coated stainless steel chronograph wristwatch with black dial and date. A very rare and unusual stainless steel single-button fly-back chronograph wristwatch with two-tone silvered matte dial and red center minute recorder hand. An extremely rare and highly attractive stainless steel chronograph wristwatch with white matte dial, tachometer bezel, and bracelet. A very fine and rare stainless steel chronograph wristwatch with enamel dial and three-colored tachometer scale. An extremely rare, attractive and large stainless steel chronograph wristwatch with silvered dial, red and black filmometer scale and bracelet. A very fine and rare stainless steel chronograph wristwatch with matte grey dial, tachometer bezel, date, bracelet, presentation box and guarantee. An attractive and rare stainless steel chronograph wristwatch with black “racing” dial, luminous indexes, tachometer bezel, and bracelet. An extremely rare, attractive and important stainless steel split-seconds chronograph wristwatch with off-white lacquered dial, accompanied by a signed poster by Sir Jack Brabham and letter confirming its provenance. An extremely rare and highly attractive stainless steel chronograph wristwatch with “flying saucer” black dial and bracelet, accompanied by original Rolex guarantee and presentation box. A very rare, highly attractive and large stainless steel split-seconds chronograph wristwatch with three-tone silvered dial, fancy lugs and bracelet. An extremely rare, highly attractive and large stainless steel chronograph wristwatch with black lacquer dial, tachometer and telemeter scales. An extremely rare, unusual and oversized asymmetrical stainless steel chronograph wristwatch with golden brown colored dial, aperture for date, and revolving inner bezel. A very rare, highly attractive and large stainless steel split-seconds chronograph wristwatch with rose and off-white two-tone dial. A very rare and attractive stainless steel fly-back chronograph wristwatch with black lacquered dial and gold-colored tachometer scale. An extremely rare, oversized and important stainless steel split-seconds chronograph wristwatch with silvered matte dial, pink gold raised Arabic and baton hour markers, outer blue telemeter and black tachometer scales. A very rare and attractive PVD coated stainless steel chronograph with black dial, date, and revolving bezel, made for the Israeli Defense Forces. An extremely rare and highly attractive stainless steel chronograph wristwatch with black dial, tachometer bezel and bracelet, engraved Khanjar emblem on the caseback, made for the Sultanate of Oman. An oversized, rare and historically important asymmetrical chrome plated pilot’s chronograph wristwatch with black dial, single button pusher and military markings, made for the US Army. An extremely rare, highly attractive and important stainless steel chronograph wristwatch with United Arab Emirates Desert Eagle Coat of Arms and bracelet, presented with original box and hangtag. An extremely rare, oversized and important stainless steel fly-back chronograph wristwatch with black dial, rotatable bezel and expandable bracelet, presented with original delivery slip, produced for A. Cairelli. A very rare, attractive and historically interesting stainless steel chronograph wristwatch with black lacquer dial. A very rare, important and oversized stainless steel single-button fly-back aviator’s chronograph wristwatch with black dial, large crown and revolving bezel. An extremely rare, oversized and important stainless steel pilot’s split-seconds chronograph wristwatch with silver-colored 24-hour dial signed “A. Cairelli”, made for the Italian Army. An extremely rare, attractive and large stainless steel fly-back chronograph with two-tone silvered dial, black hour markers and blue tachometer scale. An extremely rare and oversized nickel chromed single-button chronograph wristwatch with enamel dial, Breguet hands and hinged caseback. A fine, rare and oversized stainless steel chronograph wristwatch with black dial and luminous Arabic hour markers. An extremely rare and attractive stainless steel chronograph wristwatch with black dial and bracelet, accompanied by presentation box and guarantee. An extremely rare, important, attractive and large stainless steel chronograph wristwatch with silvered dial, tachometer scale and applied Roman and dot hour markers. An extremely rare and highly attractive stainless steel single-button chronograph with multi-tone silvered dial, blue tachometer scale and bracelet. A very fine, rare and oversized stainless steel split-seconds chronograph wristwatch with silvered dial, applied hour markers and tachometer scale. A very attractive and rare stainless steel chronograph wristwatch with ‘tropical’ black dial and tachometer scale. A very rare and highly attractive stainless steel chronograph wristwatch with black dial incorporating ‘cherry logo’, engraved tachometer bezel and bracelet. An extremely rare, attractive and large stainless steel antimagnetic chronograph wristwatch with salmon colored dial, tachometer and telemeter scales. An extremely rare and highly attractive stainless steel chronograph wristwatch with silvered matte dial, applied white gold Arabic and square facetted hour markers, downturned ‘spider’ lugs and tachometer scale. A very rare and highly attractive stainless steel fly-back chronograph wristwatch with silvered dial, tachometer and telemeter scale. A very rare and oversized stainless steel pilot’s single-button chronograph wristwatch with black dial, rotatable bezel with triangular shaped luminous markers, tachometer and telemeter scales. A very attractive, rare and oversized stainless steel chronograph wristwatch with black and grey colored-dial, mirror-polished raised Arabic hour markers, and telemeter scale. A very rare, attractive and oversized stainless steel split-seconds chronograph wristwatch with silvered dial with copper ring, telemeter scale and snail-shaped tachometer scale. An extremely rare, highly attractive and large stainless steel chronograph wristwatch with ‘tropical’ dial, tachometer and telemeter scales, accompanied by presentation box. A very rare and highly attractive stainless steel chronograph wristwatch with raised Breguet hour markers, outer red telemeter scale, blue snail-shaped tachometer scale and bracelet. A very rare and attractive stainless steel chronograph wristwatch with black galvanic dial, tachometer and telemeter scales. A very rare and highly attractive stainless steel chronograph wristwatch with date aperture, blue colored dial, bracelet, tachometer and pulsometer scales. A very rare and highly attractive stainless steel chronograph wristwatch with silvered dial, outer blue pulsation scale, and original hangtag. An extremely rare and highly attractive stainless steel chronograph wristwatch with multi-colored dial, large art-deco style hour markers, tachometer, telemeter and pulsation scales. A very fine, rare and attractive stainless steel chronograph wristwatch with glossy black dial and gold-colored pulsometer scale. An extremely rare, highly attractive and large stainless steel chronograph wristwatch with charismatic black and grey colored dial, tachometer, telemeter and pulsation scales. An extremely rare, attractive and important stainless steel chronograph wristwatch with silvered dial, blue pulsation dial, tachometer bezel and bracelet.